In my previous post I wrote about a new series of pipes I have been thinking about. The idea is simple: if a troll made a pipe what would it look like? According to the hilarious Norwegian film, Troll Hunter, the combination of concrete and charcoal is irresistible to trolls. My first sketch resembled two dirty rocks. Trolls are not very bright, so I figure one wouldn’t spend much time making a pipe look very nice. My second sketch was of a fallen tree, roots and all, with a bird house/hole as the pipe bowl (presumably the birds moved out when the troll tore the tree from the ground). The tree pipe would be smoked by a larger variety of troll. They would probably smoke a combination of tobacco stolen from a barn, charcoal, and shredded tires (which they also find irresistible). My next series of sketches more closely resembled traditional pipe shapes — horns to be exact (sometimes called hunters). Imagine: a troll kills a bunch of sheep, or a a few goats; after the meal the remnants of ruminants are lying around; the troll grabs a horn and settles down for a nice after dinner smoke. Yum. Unfortunately (or fortunately, depending on your point of view), I don’t have a ready supply of animal horns laying around so I could not easily replicate this scenario. Thinking of other shapes a troll’s pipe might take, I glanced out my window toward the pile of firewood in my backyard. I’d been to the cabin recently and cut some small, two to three inch diameter, downed aspen for firewood. The greenwood, bark still attached, struck me as having troll pipe potential. I grabbed a piece and headed down to my shop. I made a quick sketch. I didn’t want to shape the wood too much — just lop off a piece and drill a bowl chamber. But what kind of stem and how to attach it. For a complete unrelated woodworking project I need to install some spindle legs with a tapered tenon. I decided to use this joint for the stem tenon. In fact I decide to use the same taper for the bit end too. The pipe came together very quickly. Within an hour and a half I had the bowel shaped, all the holes bored, the bit formed, and everything buffed with carnuba wax. The finished product follows this brief: a young Mountain King troll breaks into your cabin; among other things it breaks up your kitchen chairs and scatters your fireplace wood all over; after eating all of your cat food it leaves, taking with it a chair leg, a piece of firewood, and a tin of tobacco. Later, it makes a pipe with the absconded wood. What does the pipe look like? Hint, the pipe could also function as a bludgeoning device. The finished pipe very closely resembled the carvers mallet sitting on my workbench, so, “mallet” is what I call this new pipe shape. The green poplar wood bowl and maple stem smoked quite well, surprisingly. I think it will take a while to break in though. 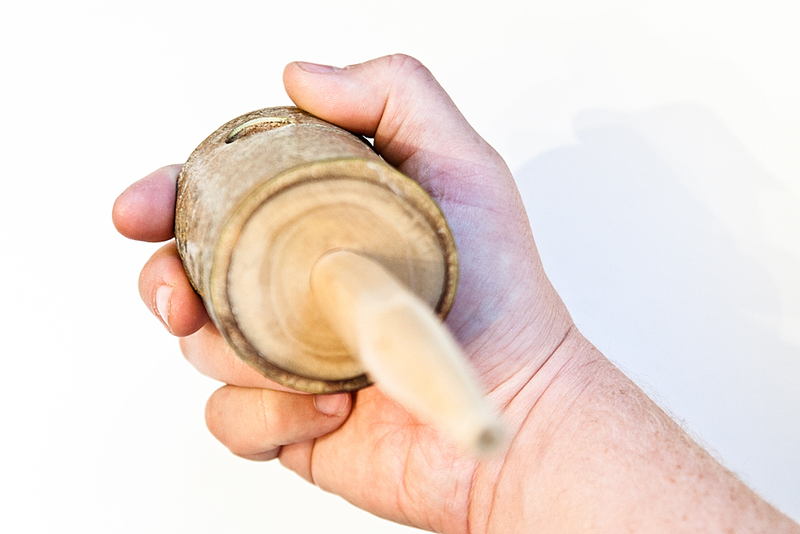 The mallet shape, while a little to unwieldily to hang between my teeth (a real troll could probably manage), rests wonderful in the palm of my hand, the thumb and middle finger wrapping around the barrel, and the index finger cupping the end. When packed and lit the mallet can be temporarily set on the end face while you tend to other business (troll business, I suppose). I smoked the same Royal Coachman tobacco I have been smoking in my Brigham Voyageur. I’m becoming less a fan of this blend as time goes on. Time for a visit to Epicure to pick up something different. I’m not yet a connoisseur of tobacco so it might be hit and miss for a while. I can’t yet describe what I do or don’t like about a particular blend. Some ingredient in Royal Coachman just doesn’t agree with me. If you have any hints, let me know. Today I probably won’t be making pipes. Today I will be making pies (similar spelling, but moderately different result). Pumpkin and apple. Not troll. It’s (Canadian) Thanksgiving today. Happy Thanksgiving. Happy pipes. Happy trolls. P.s. Whatever becomes of this pipe, I will always have fond memories of it because it was while smoking the Troll Mallet for the first time that I figured out how to blow smoke rings! In a previous post I admitted my new guilty pleasure — pipes. Besides the taste and smell of pipe tobacco, and the romance of smoking a pipe, I am also drawn to the aesthetics of the pipe shape for it’s own sake. Last weekend I made my very first pipe. I recently watched the Lord of The Rings trilogy (“LoTR”) and had become enamoured with the long-stem churchwarden-style pipes smoked by all the main characters. I decided to make my own. As with all pipes, the stem of a churchwarden is as important an element in the pipe’s design as the stummel (bowl and shank). 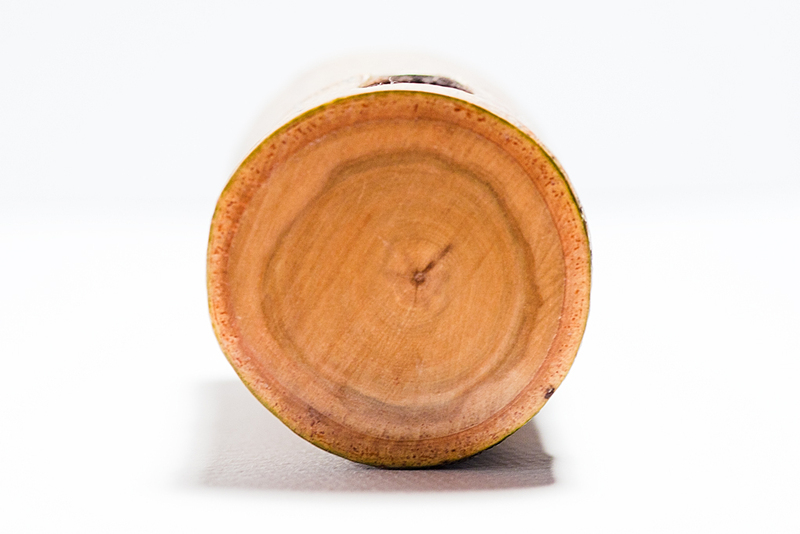 Sadly, in the pipe world, the shape and finish of the stummel get most of the attention. 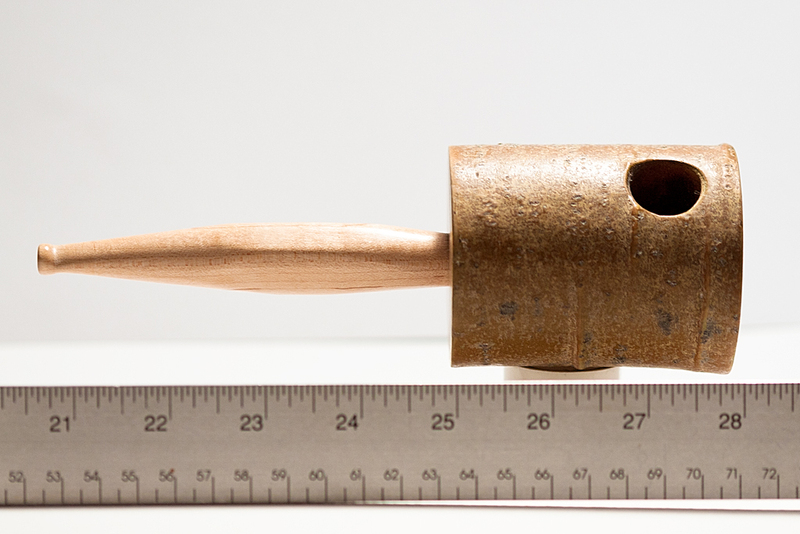 In all my on-line research, I could find very little information about how to drill a small hole (1/8 inch or less) in a long (12 inch) piece of wood. I had some thin scraps laying around from another project so I opted for a bent laminate stem. 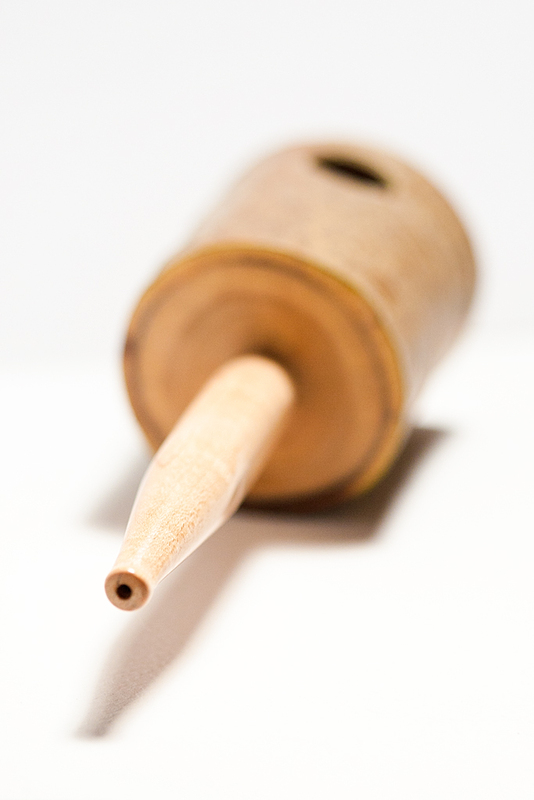 The stem is maple and the draft hole was manufactured as part of the lay-up process (i.e., the stem consists of a top skin, two sidewalls, and a bottom skin). I managed the final rounding of the stem with a spokeshave, file (for the bit), and sand paper. Because I do not (yet) have a lathe, I opted to join the stem to the shank using a hollow dowl — it was easier to drill a mortise in the stem than to carve a tight round tenon. The bowl is a conical shape that blends simply into the round shank. I didn’t model this shape on any pre-existing pipes. It just seemed natural and fits my hand nicely. I wasn’t to trying to replicate a specific pipe from LoTR either. I just wanted something that might look like it was carved from available materials in the wild by an experienced but refined adventurer. [pullthis]This is not your father’s billiard[/pullthis]. The bowl was roughed out on the bandsaw and then hand carved, primarly with bent gouge and shallow fishtail gouge chisels (I recently acquired a basic set of round carving tools by Henry Taylor). I sandblasted a light texture in the chiselled hollows (a sand blasting cabinet is on my shopping list). The chiselled ridges and flat bowl top and bottom were smoothed and polished with tripoli and diamond compounds. The bowl and stem were brought to a nice shine with carnuba wax. 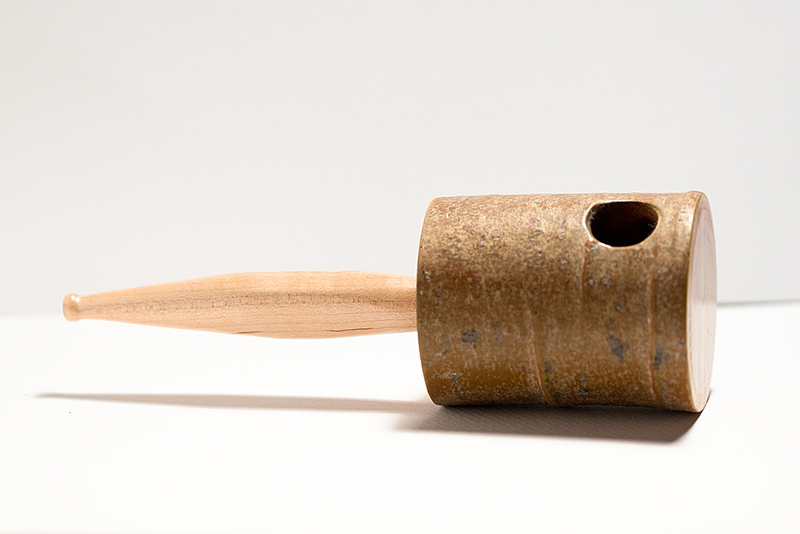 I didn’t use any dies on this particular pipe — it’s au naturel. I chose walnut for the stummel for several reason: 1) it is very hard; 2) I had some on hand; 3) I haven’t ordered any briar yet; 4) it provides a nice contrast to the maple stem. 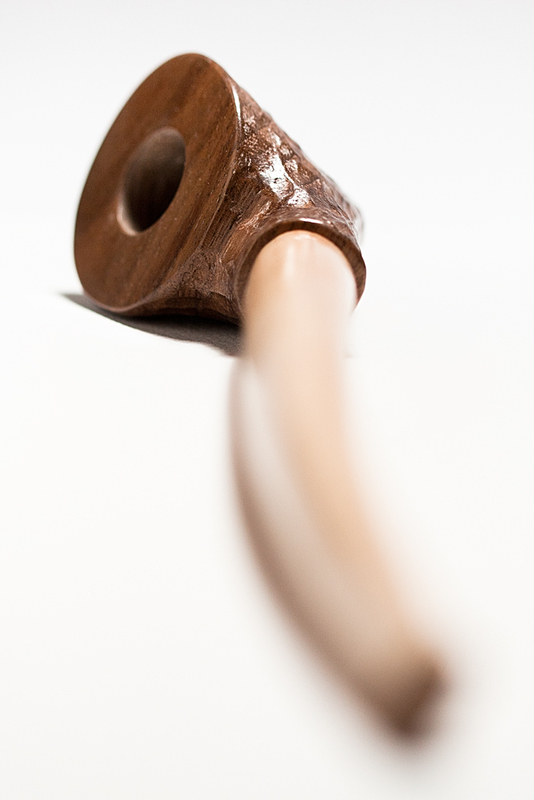 Most modern pipe bowls are made from briar, though other woods have been popular in the past (particularly orchard woods). 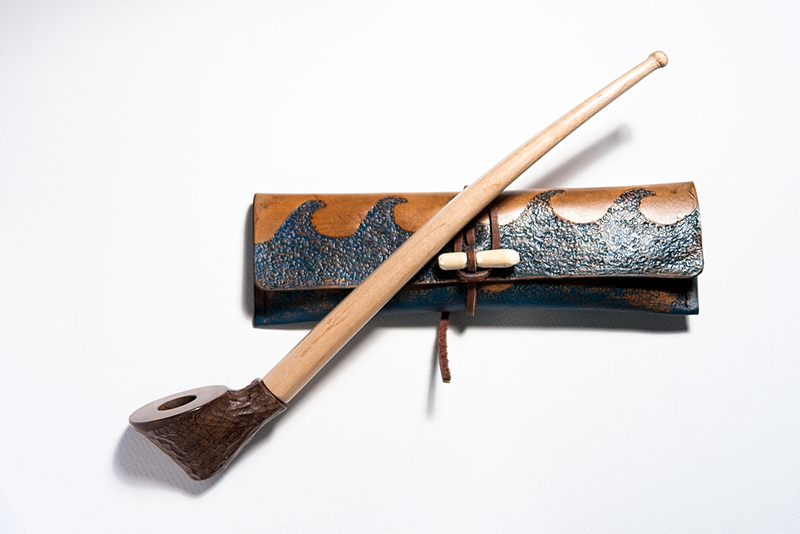 Some eastern European pipemakers still produce pipes with cherry and pear wood (Mr. Brog in Poland, and Golden Gate in the Ukraine, for example). The current eastern European predilection for non-briar pipes may be motivated by sentiment, but in the past woods like cherry and pear were used out of necessity — during communist times it was nearly impossible to import briar. It was a joy to make my first pipe, the Ranger. Other than the stem, which took a bit of thought, the entire piece came together quite easily. Ranger smokes very nicely. The long stem provides a very cool smoke, and I had fewer relights than with my Brigham Voyageur. I’m still breaking it in, but so far the flavour is very pleasant. The draft hole is perhaps a bit too large (not much resistance), but that could be fixed with retrofit in the tenon. It will be a while before I know how the walnut will hold up to the heat. I’m also a bit (no pun intended) concerned about how the bit will hold up over to time. If the bit wears out prematurely I can retrofit a vulcanite replacement without substantially altering the stem. This is not meant to be an everyday smoker. At 12 3/4 inches long its more of a showpiece to be smoked for fun. I think for now I am done exploring this line. In fact, I’ve started sketching a new series of concepts partly based on a more recent movie destined to become a cult classic — the Norwegian film Troll Hunter (you have to watch it — Blair Witch meets District 9, and its not based on a f@cking comic book). This new idea also came to me after seeing Michail Revyagin’s brilliant Troll Bulldog, though my concepts are not likely to end up as sophisticated. 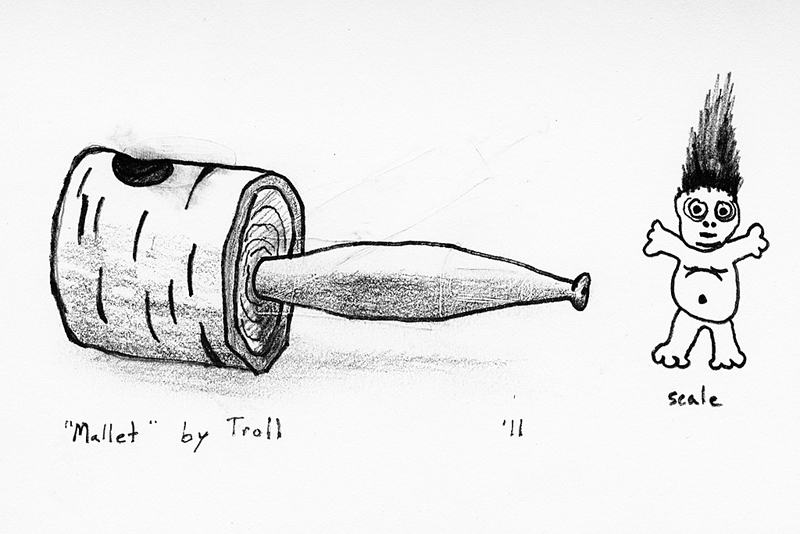 My jumping off point is a simple question — if a troll made a pipe, what would it look like. Not pretty, I assure you. I’m not a full-time photographer who can teach you the latest HDR techniques. I’m not a hot-shot graphic designer with a requisite black turtle neck. I’m an observer. I’m a synthesizer of information. I see myself as a scientist, even though I dropped out of grade 10 biology. I’m a researcher, but hope to never have to write a grant proposal. All things considered, I’d rather be canoeing.